A Bellingham, Massachusetts teacher has been placed on administrative leave after allegations surfaced that the teacher recorded a student in a faculty bathroom. Bellingham School Superintendent Peter Marano said the teacher — whose name has not been released — was placed on administrative leave on Nov. 9 as soon as the school district received the complaint. The report was forwarded to Bellingham police, who began an investigation. "It appeared it was set up being disguised behind something," said Bellingham Police Lt. Kevin Ranieri of the alleged recording. "A lot of people are surprised when they heard of it. He's been there a long time and he's well-liked by many." 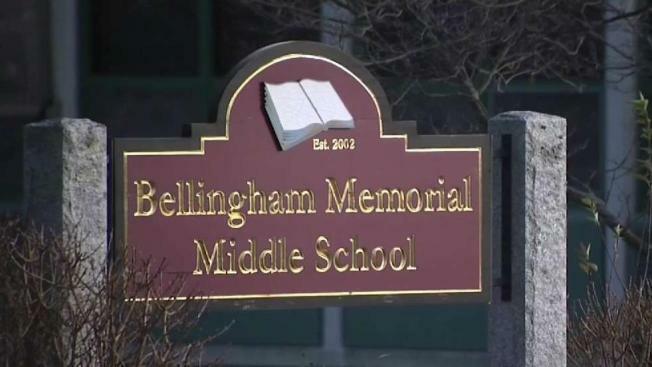 Authorities said a 14-year-old male student at Bellingham Memorial Middle School was in a faculty bathroom last Friday when that student noticed a cell phone on top of a locker that looked out of place. The bathroom is described as a coach's bathroom in a locker room area. "Somehow he was able to see this and it didn't look right to him, it was behind like a box in there and he saw it and he couldn’t figure out why it was up there and sure enough it was a phone," Ranieri said. After the student reported it to the school resource officer, the teacher's cell phone was confiscated. The school district said it is conducting its own investigation. "This individual was immediately removed from the classroom when the district learned of the alleged conduct and we immediately contacted the police. We continue to remain committed to our efforts to ensure a safe learning environment for all students. Student safety is our highest priority," Marano said in a statement. The student was interviewed by police as well as the district attorney's office. Police said the teacher has been cooperative and has no prior criminal record. "If he did it, he's going to have to pay the consequences and if he didn't, then hopefully we can clear his name," Ranieri said. Anyone with additional information is asked to contact Bellingham police.